THE NATIONS LARGEST STOCKING DEALER OF USED PALLET RACKING AND OTHER WAREHOUSE EQUIPMENT! 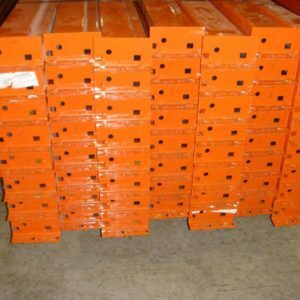 We stock over 50,000 beams and 15,000 uprights at all times! 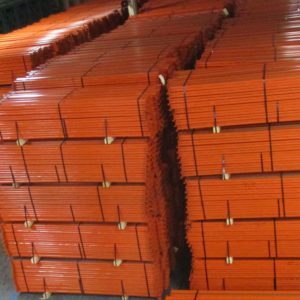 “Pallet racking” is used to store palletized products in your warehouse. It comes in many different varieties. Pallet Racking enables you to store your products vertically within your given warehouse space while utilizing your cubic footage available and freeing up valuable floor space for forklift travel and other storage requirements. With the rising cost of warehouse space it is always a good idea to incorporate pallet racking in to your application to avoid the often unnecessary expense of excessive warehouse space. Pallet racking simply saves you money in efficiencies and real estate costs if your operation calls for handling pallet products. Selective pallet rack is today’s most popular style. 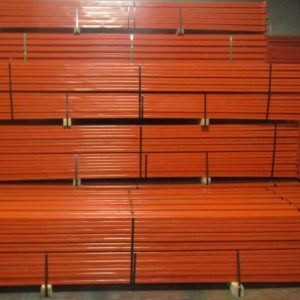 Like all pallet racking, selective pallet racking is built from structural steel or roll formed steel. Selective Pallet racking affords the user better selectivity over other types of pallet racking like drive-in or drive-thru for example. 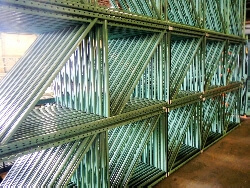 When using selective pallet racking the user will typically have single rows of racking that are set up back to back. All products stored on or off a pallet on the pick side or pick aisle of the pallet racking row can be easily accessed by the warehouse worker. This type of pallet racking system creates efficiencies in the stocking and picking process due to the variety of products /SKU’s that are easily accessible. 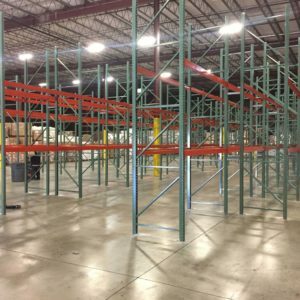 When it comes to using pallet racks for storage in your warehouse, there are many different systems that you can utilize for greater efficiency and maximum usage of space. One such system is called selective pallet racking. 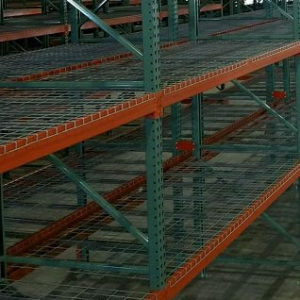 Selective pallet racking is one of the most commonly used systems in industrial applications because it is very adaptable to different product and equipment types. 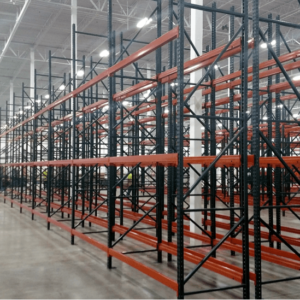 Read on to learn more about how selective pallet racking works, the pros and cons of this type of system and how you can begin designing your selective pallet racking systems. 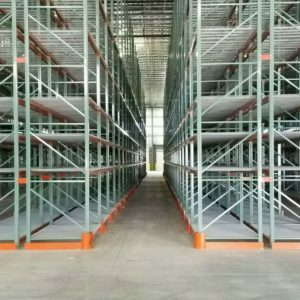 How Does Selective Pallet Racking Work? A basic selective pallet racking system is created using uprights, which are the vertical support system and beams, which support the pallets. The beams are attached to the uprights, and their heights as well as lengths will determine the capacity of your system. You can arrange your selective pallet rack system in either a single aisle or back-to-back aisle configuration, with back-to-back bays sharing uprights. With selective pallet racking, trucks can easily access nearly any pallet from the front of the bay. Selective pallet racking is beneficial for your warehouse because it is a very versatile system. You will be able to easily access and rapidly pick pallets with little handling on the part of your staff. Selective pallet racking is a great system for any type of forklift, with no special equipment necessary. It is also very simple to adjust your system by changing the height of the beams. You can use selective pallet racking for either a first in, first out (FIFO) or last in, first out (LIFO) system. 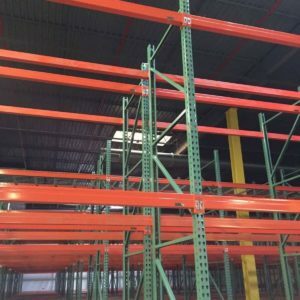 Selective pallet racking is best for a variety of products that move quickly through your warehouse. 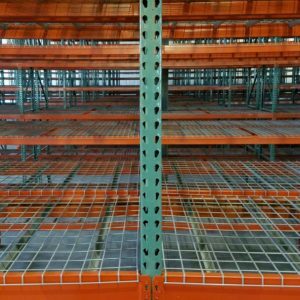 While selective pallet racking is an excellent system for many, it does have a few disadvantages. In this system, only 20% of your warehouse space can be used for product storage; up to 80% will be required for wide aisles. 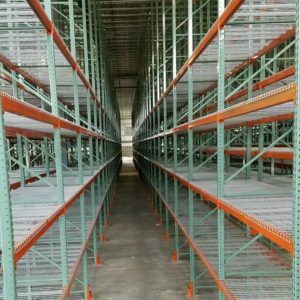 In addition, selective pallet racking comes with a height limitation of about 40 feet. Finally, selective pallet racking can be a very costly system if you are handling product at a large volume. 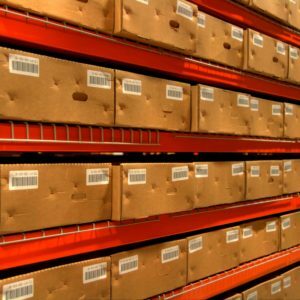 When it comes to designing your selective pallet racking system, the first step is to take measurements of the products that you need to store. This includes height, width, depth, and weight. Next, you can determine the necessary specifications for the components of your system – bay width, upright depth, and number of rows. Finally, ensure that you take not only products but also ceiling lights and warehouse sprinklers into account when determining height.